After his January 24 release from jail, what’s next for 52-year-old Basuki “Ahok” Tjahaja Purnama, the former governor of Jakarta, is marriage. In a meeting with Oesman Sapta Odang (OSO), the leader of Hanura Party, the former governor confirmed that wedding bells are ringing soon for him and his 21-year-old policewoman bride, Second Brig. Puput Nastiti Devi. 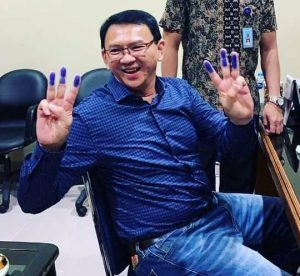 Ahok has asked to be called BTP, for his initials, following his release from prison as a signifier that he is a new man. His conversation with OSO, which took place on Friday, January 25, was recorded and uploaded on OSO TV, Oesman’s YouTube channel. His mother also counseled him to get married before he reached 55. Of his intended bride, BTP said that Puput, who belongs to a family of police officers, has been aiding his mother with cooking duties for some time now. Puput came into BTP’s life in 2016, after Gen. Tito Karnavian ordered full police protection for the former governor’s family in the wake of the “411” rally in 2016. Puput had been an aide to BTP’s former wife, Veronica Tan. BTP and Tan were divorced in April 2018, after more than 20 years of marriage. But according to BTP, he never had the intention of dating a policewoman. He also says that their matching palm lines had something to do with their coming together. When BTP met Puput, to his surprise, their palm lines matched. They even showed this to the camera in the interview with OSO. As to the date of the wedding, tempo.co quoted City Council speaker Prasetio Edi Marsudi as saying that it will take place on February 15, the day after Valentine’s Day. He also said that he would stand as a witness to the union.